We have had a couple of memorable successes with duck breasts before, particularly with rösti, but recent rösti attempts have been less successful so we decided on sautéed potatoes to accompany these instead. Armed with a large bag of potatotes and the last two duck breasts from the shelf in Waitrose, we set about preparing. We served it with a redcurrant and red wine sauce and some sautéed greens of the sort that we ate for seven days in a row a few weeks back. It turned out very well indeed. 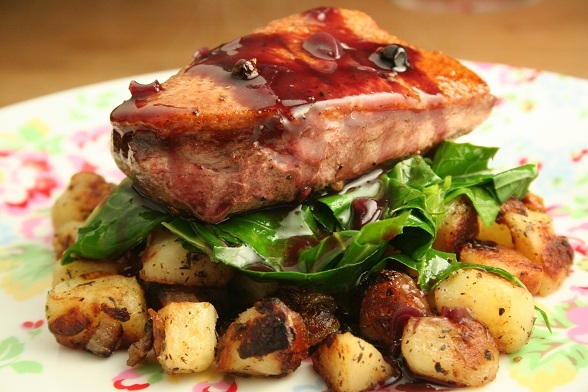 The duck breast was cooked pinkish, just how we wanted it to be, the sauce had (almost) just the right amount of everything in it and the potatoes turned out to be the best ever. The potatoes were the big revelation from this meal; we have cooked them many times and I think it was the addition of garlic this time round that made a big difference. Along with letting them crisp up slowly while the sauce and duck cooked. Score the skin side a few times, this will allow the fat to cook out more easily. Heat a frying pan on medium heat and put the duck breasts in skin side down. Cook for about ten minutes; the fat will render out from under the skin and should leave the skin nice and crispy and you’ll end up with lots of fat in the pan. Then turn them over and cook for another five. Remove and let them rest. Pour the red wine into a small saucepan along with the stock, thyme, bay, juniper and redcurrant jelly. Bring to the boil and lower the heat to a simmer and leave it for another ten minutes. Taste and add salt, pepper and vinegar to taste as you see fit. Mix the cornflour with a dash of water and then add it to the sauce to thicken it, stirring all the time. Slice the potatoes and boil or steam until almost cooked. Slice into 1cm cubes. While this is happening, heat the olive oil in a large frying pan over low to medium heat. Add the onion and allow to soften for five minutes. Add the garlic and cook for another 5 minutes. Just allow these to soften, not brown – there will be plenty of opportunity for that later! Then add the cubed potatoes, with a little extra oil if it looks like it needs it. Season liberally with salt and pepper and thyme. Cook on a low heat for 20 to 30 minutes, shaking the pan and turning the potatoes frequently to allow them to brown on all sides. Taste for seasoning and add more salt, pepper or herbs as you see fit. Subscribe to comments with RSS	or TrackBack to 'Duck Breast with the Best Sautéed Potatoes'. I was once told for crispest results start the duck skin side down in a cold pan and bring it up to temperature; i’ve never done a test though. That redcurrant sauce looks delicious. This looks absolutely mouth-watering. I think I need to go pick up some duck breast after work. Thanks! Thanks, Steve. I hope you enjoy your duck! Thanks, Emily. Have a good look in the supermarkets over the next week or so, duck breasts are often reduced at this time of year since people have so much other meat to deal with.